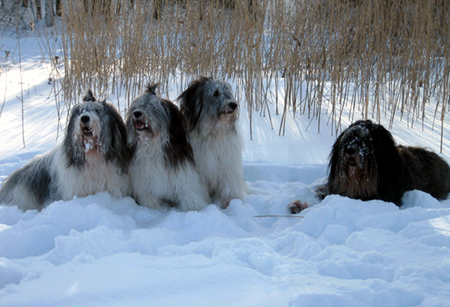 The photo includes from left Flinkbein Zupelny Sukces "Milou", Cynia Moscic "Lani", Cedr Moscic "Ceder" and Flinkbein Srebro "Kingi". ". Do I have the patience and time necessary to foster ? Do I have the room in my house to take on a foster PON ? How will my PONS and family react ? Will males be accepted? Can I take in puppies or only adult, house-broken PONS ? How long can I or should I keep my foster PON ? Count on a PON marking or having accidents the first few days, even if he was housetrained. Have pet-specific cleaning products on hand. Also be prepared for other transitional behavioral problems. Owner knowledge and training is the key to a successful fostering. It's all up to you. No one training approach is right for every PON..
Keep an ID tag attached to a snug buckle collar on your PON at all times. During the transition period, a foster PON needs time to adjust to the rules and schedule of your household. And he needs your leadership! A dog is a pack animal looking for guidance, and it is up to you to teach him good, acceptable behaviors. If the human does not take charge, the dog will try to. A foster PON cannot do damage unless you let that happen. Watch your foster PON during the transition period. Remember: Many PONS in trouble may not have had the luck to be properly socialized . As you can see, fostering,is not uncomplicated. Join our pon rescue group in order to participate in rescue training, and exchange valuable information and advice from other prospective foster/rescue families. Ever consider what our dogs must think of us? chicken, pork, half a cow. They must think we're the greatest hunters on earth!